I love to read (have you checked out my shelf, over there? -->). I didn't really like it when I was in school, I freely admit. Something about HAVING to read makes you less likely to read recreationally. Have you noticed? It's like, "Read? I just had to stomach 50 pages of Economics in the Global Marketplace. I'm taking a nap." Anyway, I've realized I enjoy books about people escaping captivity. I find it fascinating how the characters (either real or fictional) survive their captor's oppression and manage to flee to freedom. My friend Jae recommended it and I decided to give it a whirl. Very glad I did. Here's the gist: A woman is kidnapped as a young adult. While in captivity, she has a son. His name is Jack. When the story starts, he is 5 years old. He is the one telling the story. I know, I know -- "Ugh, I don't want to read a story from some KID'S perspective. I'll pass." But trust me. It. Is. Amazing. I laughed. I cried. I gasped in horror. I bit my nails off (all of them). I read it in approximately two days. I could not put it down. Remember how much I loved The Help? I said (and I quote), "I think everyone in America should read it." 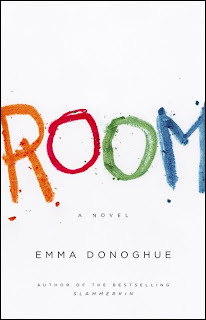 Well, that's how I feel about Room. It will change you. So, if you haven't read it, go to the library and put yourself on the waiting list (there probably is one) or heck -- just go buy it because you won't regret it. I promise. I will take that challenge! I just finished "I Capture the Castle" by Dodie Smith and it was lovely. It's not gritty or in your face but it made me so very happy. I feel you about that genre- so thrilling! I'll certainly read this next. I'm reading "The Kitchen House" currently. It's going slow-er. Did you like "Escape?" Those Polygamny stories give me the heebies. Can you imagine being born into that? Ah! I read that! I liked it. If you like escape type stories you should read Stolen Lives by Malika Oufkir. True story about her and her family being imprisoned. Yay! Can't wait to read it. I've been looking for a new book, so I'll have to try both Room and The Help. Thanks for the suggestions!! @Creole Wisdom, I do love Holocaust books ... I know that sounds so morbid, but I think sad stories, especially true ones, have the most potential to change people's hearts. Send your suggestions my way. @Brits, @Elise: Thank you for the suggestions! I'll add them to my list! "Room" is currently waiting for me at the library! I am excited to pick it up tomorrow... I recommend reading "Sarah's Key" - it is a very touching book about the Holocaust. I saw Escape on your shelf the other day. I read it about a year ago and really liked it. Another book that is good is "The Handmaids Tale" by Margaret Atwood. It came out in the early 90's but I would say to definitely check it out. BTW, Happy Belated 24th Birthday!!! read The Glass Castle it is such an inspiring book! !